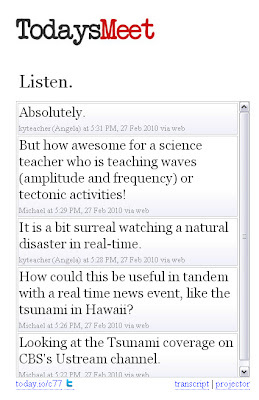 With today’s earthquake in Chile and subsequent Tsunami warnings throughout the Pacific, social media really started to paint an incredible picture of how information flows now. 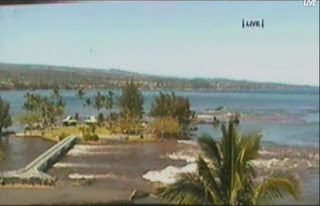 As a matter of fact, the ebb and flow of the tsunami in the Hawaii footage was symbolic of the ebb and flow of information being reported. 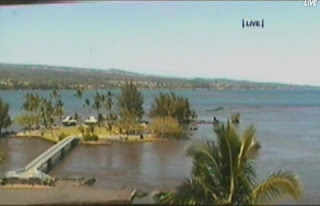 It started with a watch for the water to start moving in and during that time, there was a lot of talk about the earthquake, the expectations of the tsunami, how the tsunami would cause damage, the shifts of oceanic crust the propagated the tsunami – lots of science being discussed. 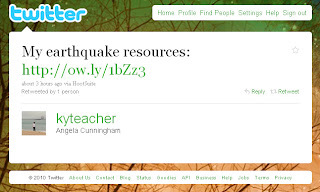 This made me think about all of the new ways that we could engage the teachable moment now with web tools. 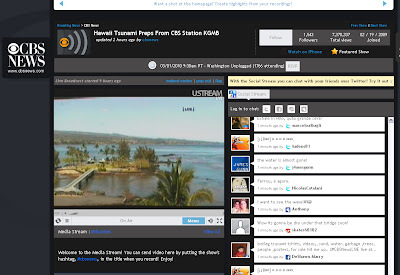 Specifically, today, I used Ustream, TodaysMeet, Picasa for the Screen Captures, Twitter, and resources from Mashable’s Weblog. 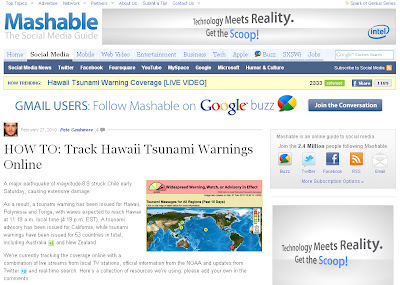 The screenshots below represent links to content about the Earthquake and/or the Tsunami. What a spectacular learning event! At the time, a lot of the staff development I was doing centered around instructional technology and I thought it fit in perfectly with the notion that it's not about the tool, it's about the task. I think about the quote every once in awhile, but lately, it's really been resonating in the work I'm doing. The last few weeks have been filled with instructional coaching opportunities that have largely boiled down to differentiated instruction and choices for students. Specifically, I've been talking a lot about strategies and Web 2.0 Tools, but not necessarily describing the tools so much as divining the purposes of the tools for a particular task. At this point, it's come down to how the purpose for learning is related to the methodology. It's always going to continue to be about the content, and not the resource. The tools are meant to be a value-added feature of instruction, but not intended to replace the content. What I mean by that is yes, I need the drill to make the hole, though the drill isn't the only way to make the hole, but I still need the hole whether the drill is around or not. I also don't necessarily need to be proficient with the drill to use it effectively. This is important. I still need to meet my objective, which is to create a hole, but I can do that without knowing everything there is to know about the drill, beyond plugging it in and making sure I have a steady hand. There are loads of attachments and methods and strategies, I'm sure, but I don't need to know everything in order to drill the hole I need. Likewise, there are so many web tools available for use now that it would be virtually impossible for a teacher to learn them all at a proficient level before using them with their students. They should certainly investigate them, but they shouldn't feel like they have to know every tweak and nuance. Many of the students will figure those out themselves. This allows the teacher to offer several choices for tools to be used, without feeling like they have to master each and every one. All this to say, it's not the tool you use, it's the evidence of learning that occurs. If the tool enables that, great. But it's still about that hole. Also, I'd like to note that metaphorically, "the hole" comparison to learning sounds not so great to me. I don't want to give the impression that I think we should just fill kids' heads up with knowledge, like we'd bulldoze dirt into a sinkhole. I just like the quote, and it made me think. Additionally, since I'm on the subject of drills as a tool, I think it's important to recognize that the drill goes into my toolbox. 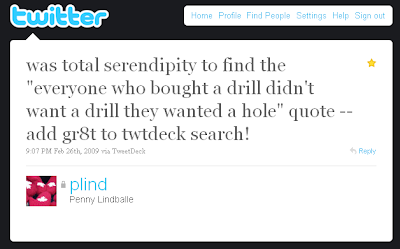 I chose it specifically for a task--drilling a hole. I didn't pick up the drill and walk around the house with it wondering what I could apply it to. My toolbox is full of tools that are appropriate for different tasks, and I have all those tools so that I can make the right choice. That toolbox is a great metaphor. The more tools we offer to the students, the more choices they have when it comes time to select the appropriate methodology for showing evidence of learning. PrimaryPad is a free web-based word processor designed for UK primary schools that allows pupils and teachers to work together in real-time. A Magazine for Teachers to help them bring a technology frame to what they are already doing in the classroom. When we tell our three year old to "clean up," often she just stares at us as if we were asking her to lick the back of her neck. We go on to say things like, "It is really messy, and we need to clean this mess up." Or, "Why did you get all of this stuff out?" Or we try to do something that, to us, is logical -- such as, "We have to clean up this mess before we get any other toys out." It finally dawned on us that we were missing some key steps here. We never told her HOW to clean the messes up, we just expected her to do it. Because we said so. Because I guess, in our brains, we didn't understand that there was a skill set involved that was beyond the basic direction. When we figured that out, things changed. It wasn't about cleaning up this mess or that mess. We had to be specific. It had to be, "Let's put these books back on the shelf...this way." (And we would show her.) Or, "These things go into your toy box." (And we put them in there together the first few times.) Now, she is still 3, but she has a better understanding of what we mean when it is time to clean up and we want her to help. I relate this story because it's come up in several workshops lately the lamentations that teachers have over expected behaviors in their classrooms. They ask the students to do something, something that we've probably ALL done at some point, with the expectation that they have the skills to be able to do it. I read the information over and over. I lay on my bed and study it. I look at the information until it is in my head. I close my eyes and try to remember. My mom (or dad) reads it to me. The work I was doing with this school last week centered around test taking strategies, study skills, and brain based instructional strategies. What their students had collectively figured out on their own, over time, was that they needed to spend time with the information they were supposed to be learning, but did not specifically know HOW to spend that time. Over the years when I've asked students to study, I had to become mindful of the specifics around the direction. In the beginning of my teaching career, I might have told children to study for their tests, and that be the end of the directive. In the last few years, I would say, "Highlight your notes and determine which pieces of information are essential to remember." I might say, "create a graphic organizer that chunks your information into smaller pieces that are more easily digested and remembered by your brain." I've tried to teach in a way that gives students multiple interactions with the information, reinforcing, hopefully, the need for multiple interactions at home. They need to see the information, hear it, manipulate it, make connections within it, apply and analyze it, create mnemonic devices if necessary, create their own study aids, including graphic organizers, and play games with the information. That's what studying is--specific strategies to get the information to stick in their brains. But the students have to be taught those strategies so that they can use them when we say, "STUDY." I've also taught my students, over the years, how I want them to take notes. I use a format called NOTEMAKING, developed in conjunction with a colleague, Vivian Demers-Jagoda, where students chunk the information they are learning, reading, or experiencing into manageable "Brain Bites." (This format is also largely based on the Cornell Note Taking System, with a few changes specifically geared to its usage by younger students) Students learn to pull out key words, big ideas, and listen carefully for questions and repetitions to help them more effectively study when the time comes. PLUS, the new format provides a more active role in their study efforts, giving them guidelines to fold on to isolate information they are trying to remember. I remember being in high school and trying to write down everything the teacher was saying, and having page upon page of overwhelming notes to study. That "studying" usually meant lying on my bed with the notes in front of me, and hoping that by magic the information stuck in my brain. I learned pretty quickly that magic doesn't work, and it was years before I discovered what did. What else do we require of students that we've not specifically taught? What expectations do we have that require specific skills that are not often part of the instructional sequence? This includes things like what we might consider "good behaviors," listening skills, conversation skills, collaboration skills, etc. Feel free to leave comments about what you do in your classroom to help students learn what is expected but not always taught. Literacy and Read-aloud sites - part of Good Sites for Kids!